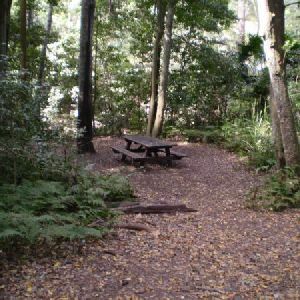 This return walk starts from the old Garawarra Farm car park and heads down the ridge through the Royal National Park, to the coast. The walk then follows the coast, through Burning Palms beach, and around the base of the headland to the famous Figure Eight Pools. This walk explores 4 distinct environments and gives a great cross section of what the park has to offer. The Figure Eight pools are on an ocean rock platform. 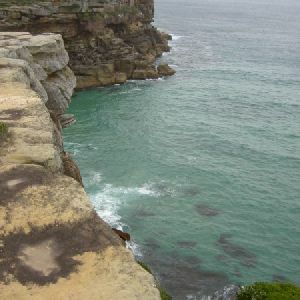 Rock platforms can be very dangerous places, especially at high tide and during high seas. Only plan to visit the rock platform at low tide and low seas (see BOM website for forecast). Please also wear appropriate footwear for the walk and rock platforms. The Figure Eight Pools have become very popular. Many people visiting the area are not well prepared and placing themselves and others in danger. Please ensure you have enclosed and strudy shoes (thongs are not enough). There are no public facilities on the walk, please carry plenty of water, food and other surplies needed. Wear approriate clothes for the walk. 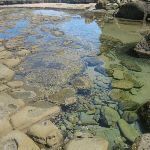 It is very very important that you only plan to visit the rock platform at low tide (check tides at http://www.bom.gov.au/australia/tides/#!/nsw-port-kembla) It is also very very important to ensure the sea&swell forecast is 1.5m or less (http://www.bom.gov.au/australia/charts/viewer/index.shtml?type=sigWaveHgt&tz=AEDT&area=SEAu&model=WR Even in perfect forecast conditions, always keep an eye on the sea (never turn your back to the ocean) and stay well back from the ocean edge of the rock platform. Diving and jumping in any rock pools is likely to cause serious injury. Mobile phone reception is very limited on the walk and not available all the way. Please watch this video and read the article to better understand the risks. http://bit.ly/1kZ3AbM. Stay safe and have fun. From the Garawarra Farm car park, this walk heads east out of the car park to turn right onto the main dirt road (that leads into the car park). A short distance down the road this walk comes to an intersection just beyond the locked gate marked with a ‘Coast Walk’ and a ‘Garawarra Ridge Management Trail’ signpost. 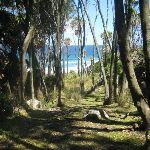 Continue straight: From the intersection, this walk follows the Burning Palms, Era and Garie arrows on the Coast Walk signpost, winding along the bush track and down the long hill. The track gradually steepens and becomes a little rougher, winding down onto the ridge line and all the way along, until it breaks out of the trees and continues down through the short scrub and blade grass to the intersection of the bush track on the left. 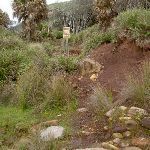 Continue straight: From the intersection, this walk follows the bush track heading towards the ocean, following the ridgeline to the signposted intersection of the ‘Coast Walk’. 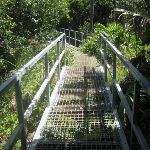 Veer right: From the intersection, this walk follows the sign to ‘Burning Palms’ along the bush track, winding down the side of the hill, past the cabins, then at the bottom the track joins onto a metal walkway that soon changes to a narrow bush track. This passes behind Burning Palms Beach until coming to a sign saying ‘Otford via Palm Jungle’. Veer left: (only to be attempted at low tide and low swell) From the beach, this walk follows the rocky passage beneath the rocky headland (keeping the headland to the right). The walk rounds the first prominent headland to a creek that drops off the cliffs above. This walk heads out onto a second prominent headland to the Figure 8 Pools. There are a number of Figure 8-shaped pools, but one main one. The pools are towards the sea, in line with the gully. 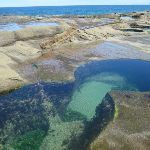 The Figure Eight Pools are on the rock shelf, south of Figure Eight Pools gully, near Burning Palms. 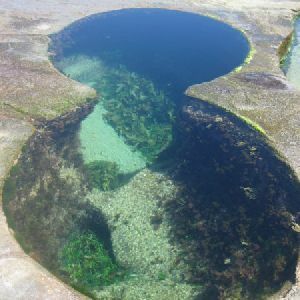 There are a number of circular sinkholes in the rock, and a few of them have joined over time to form a figure ‘8’ shape. 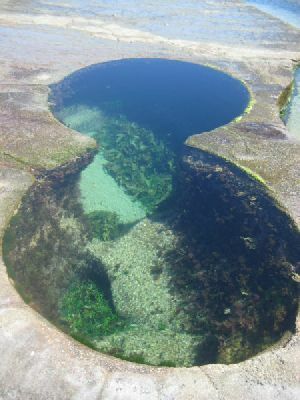 Two sink holes in particular have joined to form a very spectacular figure ‘8’ shape in the rock. 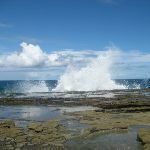 The safest time to visit the pools is at low tide when there is only a very low swell in the ocean. Around 2.8km of this walk has short steep hills, whilst the remaining 200m is flat with no steps. 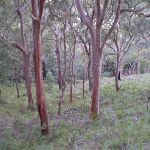 1.9km of this walk follows a formed track, with some branches and other obstacles and another 900m follows a rough track, where fallen trees and other obstacles are likely. The remaining (200m) follows a clear and well formed track or trail. 1.1km of this walk is clearly signposted and another 970m has directional signs at most intersection. The remaining (900m) has minimal directional signs. 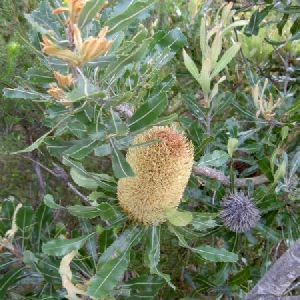 Around 1.9km of this walk requires some bushwalking experience, whilst the remaining 1.1km requires no previous bushwalking experience. Around 2.1km of this walk is not usually affected by severe weather events (that would unexpectedly impact safety and navigation), whilst the remaining 900m is affected by storms that may impact your navigation and safety. 2km of this walk has limited facilities (such as not all cliffs fenced) and another 900m has limited facilities (such as cliffs not fenced, significant creeks not bridged). The remaining (85m) is close to useful facilities (such as fenced cliffs and seats). A list of walks that share part of the track with the Garawarra Farm carpark to figure eight pools walk. 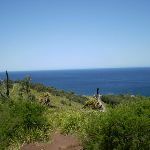 This walk starts at the large Garawarra Farm car park taking the ridge straight down to the coast. Look for the change in vegetation as you descend along the spur to the Coastal Track, before beach hopping your way to Garie Beach. 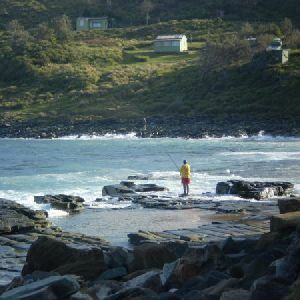 The track is a great way to see some of Sydney’s best coast, with plenty of opportunities to cool down, and maybe do a spot of fishing along the way. About half the track is through open grass land, giving panoramic ocean views, with opportunities to wander among some buildings from the depression era. This walk covers a great cross section of the environments in the Royal National park, with plenty of places to rest and take in the views. The walk follows the Squeeze Way from Garie Rd, then heads down Stockyard Spur to Era Gully. The walk then heads up to the old Garawarra Farm, via Burgh Ridge, and back along the road to the Squeezeway and Garrie Rd. There are some optional side trips to North Era and to Burning Palms for people with extra time. 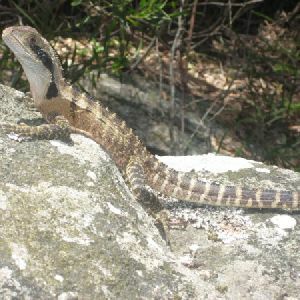 This walk explores a variety of environments through the Royal National Park. From the old Garawarra farm, the walk heads along the Squeeze Way then down a ridge to Burning Palms. There is an optional side trip out to Figure Eight pools. Burning Palms offers a nice beach and a great place to rest. From the beach the walk heads back up to Garawarra via an open grassy ridge, then through a nice shady forest track. This walk has a great mixture of ocean cliffs, with fantastic views, and beautiful forest. 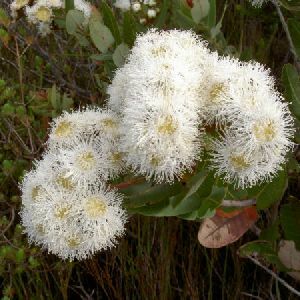 The walk follows the well maintained Burgh Track, passing great views of the ocean and the cliffs, before turning inland and exploring some eucalypt forest on the way to Helensburgh. The environment and views near Lady Wakehurst Dr are incredibly special as the track winds its way through a shrouded eucalypt forest. 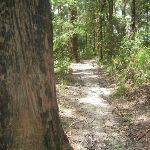 Largely along service trails and well managed bush tracks, this walk goes from train station to train station through parts of southern Royal National Park. The bush track between Garrawarra and the Hacking River is incredibly beautiful as it winds its way down the hill through shrouded eucalypt forest and low lying scrub. 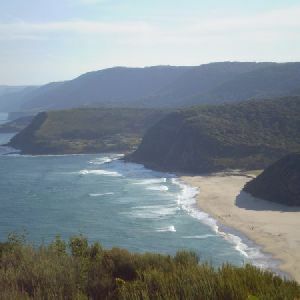 From Otford Train Station, this walk enters the Royal National Park at the coast. There are great views of Wollongong down the coast. 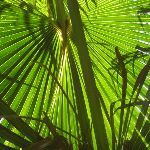 The walk also passes through the magnificent Palm Jungle and Burning Palms beach. This is a great spot to go, wet the toes, and enjoy the environment. The walk then continues to Figure of Eight Pools. 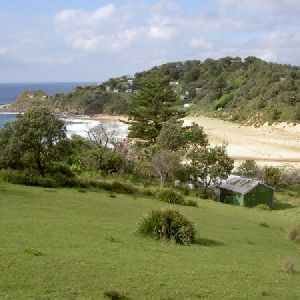 Using a variety of tracks, this walk follows the coast as well as going inland to Garrawarra Farm. With great coastal views and a magnificent palm jungle, this walk demonstrates perfectly, the diversity of the Royal National Park. Of historical significance are the houses scattered along the coast that were built during the depression. Take some time along the way to have a cool down at one of the many fantastic beaches. 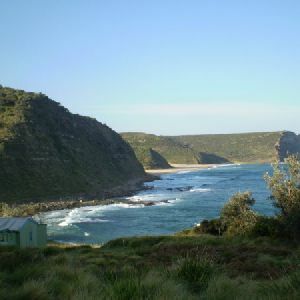 Following the coast through the Royal National Park with its magnificent coastal views, this walk is truly amazing. Although walked traditionally from Bundeena, this direction makes for a shorter first day. There are coastal and cliff views along much of this walk. There are also a small house communities early in the walk. Stay overnight at North Era Campsite. Water is very limited it is best to carry all the water you need. 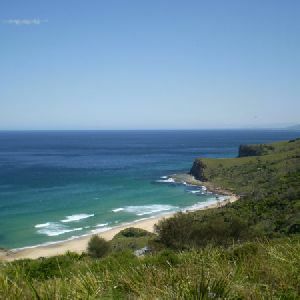 Heading south, this walk covers the coastline of the Royal National Park and can truly only be described as amazing. 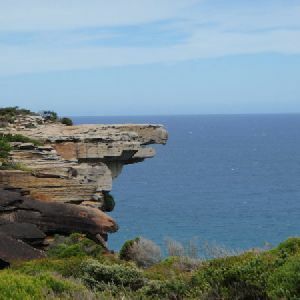 With breathtaking coastal views from Bundeena to Otford this walk follows the cliffs along a well managed and signposted track. You will enjoy the truly fantastic views out to sea and along the cliffs. Make an early start for day two, it is bigger that it appears. 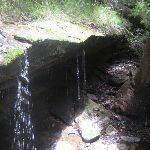 A list of walks that start near the Garawarra Farm carpark to figure eight pools walk. The walk down Stockyard Spur to Garie Beach is an excellent way to take in coastal views before following the Coastal Track. This is great if you are with a driver who is happy to drop you and wait for you are Garie Beach, or if you can do a car shuffle. You can always just walk back up. There are plenty of opportunities to get your feet wet if you wish to cool down on the walk, and you can see some of the houses built during the depression at North Era and Little Garie. 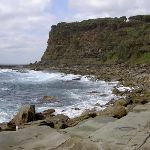 This walk, from Garie Beach to Eagle Rock, is another great way to explore the Royal National Park coastline. Eagle Rock is an iconic rock formation in the park, and this lookout provides a great view of it. 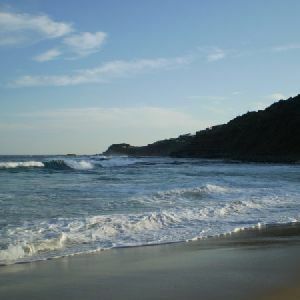 The walk then returns to the expansive Garie Beach, offering more great views as you head down the hill. Enjoy the beach before jumping back in the car. 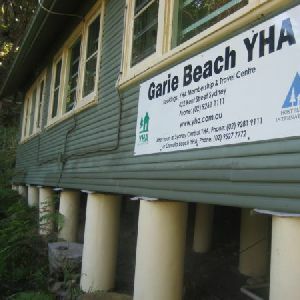 **On 02/12/2010 this YHA was completely destroyed by fire and plans for the future are not yet decided** This track is the only access to Garie Beach YHA. If you leave your car in the Garie Beach car park it is easy to head up to the hostel, before spending the rest of your time down at the beach. The hostel is basic, but luxurious for a week of surfing or exploring the coast. The YHA is not staffed and is locked, so you need to pay and pick up a key from Sydney if you wish to stay. 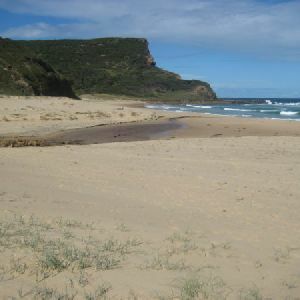 This walk is the shortest walk to North Era Beach and starts from the Garie car park. 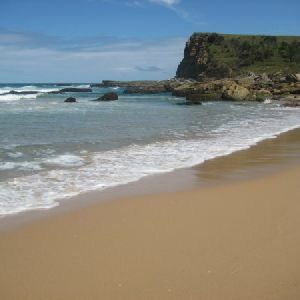 Both beaches are popular surfing beaches, and have either camping or basic hostel accommodation. This makes the walk between the beaches an excellent way to transport boards and supplies for your surf retreat, weekend getaway or just a nice stroll during the day. This walk is another Royal National Park classic. The walk comes off a ridge to join with the Coastal Track’s tour of the beaches. 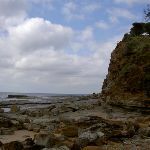 The walk starts at the small Curra Moors car park and heads through the heath and bush to the rock shelf at the coast. The track ends at Garie Beach. The beach has a kiosk and is an excellent spot for a swim (when patrolled) and a picnic. This walk is good for those who can get dropped off at the top and meet their driver at the bottom, or you may choose to do a car shuffle, or retrace your steps back to Curra Moors car park. A pleasant walk with some great views, mostly along service trails. The walk passes through heath and some areas of trees (flowering in spring). This walk follows the Coastal Track along the headland, giving great views along the coast and out to sea. Following the historic Lady Carrington Drive, this walk takes your to Calala, a quiet clearing on the Hacking River. Travelling along the old road, this walk passes a few shaded brooks as it winds alongside the Hacking River. 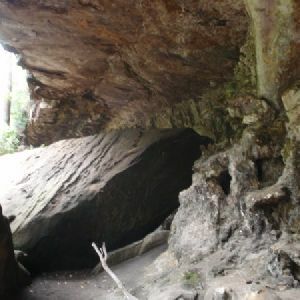 There is the chance for a side trip to Palona Cave and waterfall. 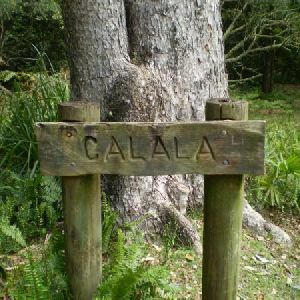 Calala is a clearing with some large trees providing shade, a picnic table and access to a beach on the bank of the shallow Hacking River. This walk follows the historic Lady Carrington Drive alongside the Hacking River. The old road is closed to traffic and provides a great way for walkers (and mountain bikers) to explore the richness of Royal National Park. 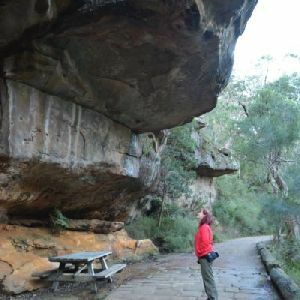 You can explore the fantastic natural sandstone rock formations, historical artefacts, read the information signs, rest in the picnic areas and appreciate the magnificent native trees. You may well be lucky enough to spot lyrebirds. The southern end has the steepest sections with the walk becoming generally flatter as you head north. Note: There is no car transport option to the start of this walk. Following the historic Lady Carrington Drive much of the way, this walk heads north until turning off the wide trail. Here the heads along a narrow track to a beautiful limestone cave. In typical sandstone country, Palona Cave’s different geology makes it well worth the visit. There is a beautiful cascading waterfall just near the cave to add even more variety. Just a bit north of the turnoff this walk describes a side trip to an old picnic area, a nice cool and shaded spot to rest. 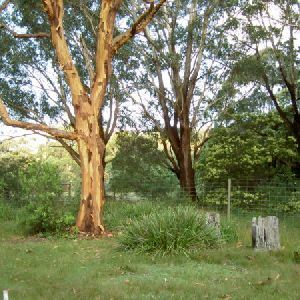 Opened in 1886, the Forest Path was once part of a controversial logging site, the first time that logging was stopped in Australia by protest. Now it is a short trail looping around the hill, following the Hacking River. Through a shaded environment of ferns and eucalypts, this walk passes through a very pretty environment that was definitely worth preserving. This walk becomes more interesting once you reach the end of the service trail section and start on the bush track. There are great views going down the hill, and once at Bola Creek the track meanders alongside the creek, through a dark forest, until meeting up with Lady Carrington Dr.
Winding next to Bola Creek, the Wallumarra bush track is very pretty, as is the track to Palona. Great rest areas at Bola Picnic Area, and next to the waterfall at Palona Cave, cap off a great walk. While the Wallumarra service trail and the side trip to the Beehives are not the most interesting tracks in Royal National Park, the Wallumarra bush track and the trail to Palona Cave make up for this. Car. A park entry fee is required for driving into the park. 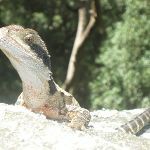 http://new.wildwalks.com/wildwalks_custom/includes/walk_fire_danger.php?walkid=nsw-royalnp-gfctfep Each park may have its own fire ban, this rating is only valid for today and is based on information from the RFS Please check the RFS Website for more information. 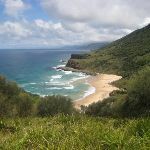 This walk starts in the Illawarra weather district always check the formal BOM forecast or pdf before starting your walk.